February’s “National Heart Health Month” may be over, but hopefully many people have become more aware and checked to see if they have high levels of cholesterol in their blood, especially elevated levels of low density lipoprotein (LDL). Various studies have suggested that high blood levels of LDL, or bad cholesterol, and/or low levels of high density lipoprotein (HDL), or good cholesterol, are associated with increased risk of heart and blood vessel disease. The good news is there are many natural ways to control LDL cholesterol including exercise, incorporating heart-healthy foods into your diet, and consuming dietary supplements. A number of studies have reported that regular aerobic exercise can lower LDL cholesterol levels (Verissimo 2002). 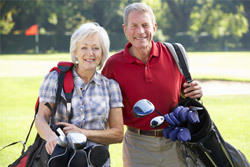 Brisk walking, jogging, swimming, bicycling, dancing, exercise class, tennis, and golf (walking the course) are all excellent forms of aerobic exercise. If you have joint issues in addition to high cholesterol, check out our blog on ten low-impact exercises that are good for your joints. Large doses (over 100 milligrams/ day) of the B-vitamin niacin can lower levels of bad LDL cholesterol and increase blood levels of good LDL cholesterol (Digby 2009). However, large doses of niacin may cause skin flushing in some individuals. Large niacin doses (over 1,000 milligrams a day) may possibly impair blood sugar regulation in some diabetics. Consult your physician before taking niacin. Plant sterols (also known as “phytosterols”) are substances that are naturally found in plant foods, including fruits, vegetables, vegetable oils, nuts, and seeds. Plant sterols can lower blood cholesterol levels by binding to cholesterol in the digestive tract. They also assist in cholesterol secretion through the bile. Plant sterols have been found to inhibit cholesterol from being absorbed by the body. Over 200 published studies have reported that consuming 800 mg. or more of plant sterols daily are associated with significant reductions of blood LDL cholesterol and may help reduce the risk of heart disease (AbuMweis 2014). Coenzyme Q10 plays a critical role in heart health. Heart patients often have low levels of CoQ10. In addition, using cholesterol-lowering statin drugs also deplete the body of CoQ10, which can cause muscle aches. Supplementation with coenzyme Q10 has been shown to significantly reduce muscle aches in patents on statin therapy (Skarlovik 2011). Resveratrol is found in red/purple/black grapes and peanut skins and has many anti-inflammatory and antioxidant properties. Recent research suggests that resveratrol can enhance heart function and support vascular health (Petrovski 2011). Quercetin is a polyphenol phytonutrient and is found in a wide variety of fruits and vegetables. Various human and animal studies have reported that quercetin has strong anti-oxidant properties and is helpful in promoting heart health ( Khurana 2013). Studies have reported that consuming milk products containing probiotic bacteria are associated with significant lowered LDL cholesterol levels (Chen 2008). Studies have reported that eating four or more grams of omega 3 fats per day are associated with significantly lower cholesterol levels. The richest sources of omega 3 fats are fatty fish like salmon and herring, fish oils, and flax oils (McKenney 2007). CHOLESTSolve 24/7 is a unique product containing a mixture of many nutrients needed for promoting good cardiovascular health. CHOLESTSolve 24/7 has 1,300 mg of plant sterols to help reduce the risk of heart disease. This is 62% more than the 800 mg. of plant sterols used in many studies. CHOLESTSolve 24/7 also contains CoQ10 to promote cellular energy. It also has a proprietary blend of four more heart-healthy phytonutrients, including resveratrol, quercetin, green tea leaf extract, and red grape seed extract. Add CHOLESTSolve 24/7 to your health regime, pump up your exercise, and try to include healthier options in your diet, to help your LDL cholesterol fall to healthier levels. AbuMweis SS et al. Implementing phytosterols in medical practice as a cholesterol lowering strategy: overview of efficacy, effectiveness, and safety. Canadian Journal of Cardiology 2014;30:1225-32. Chen CY et al. Cholesterol lowering effects of nutraceuticals and functional foods. Journal of Agricultural and Food Chemicals. 2008;56:8761-73. Digby JE et al. Nicotinic acid and the prevention of cardiac artery disease. Current Opinion in Lipidology 2009;20:321-6. Khurana S. Polyphenols- Beneficial to the cardiovascular system in health and aging. Nutrients 2013;5:3779-3827. Mc Kenney JM and Sica D. Prescription omega-3 fatty acids for the treatment of hypertriglycerdemia. American Journal of Health Systems Pharmacy 2007;64:595-605. Petrovski G. et al. Resveratrol and Health Resveratrol in cardiovascular health and disease. Ann. N.Y. Acad. Sci. 2011;1210:22-33. Skarlovik A et al. Coenzyme Q10 supplementation decreases statin-related mild to moderate muscle symptoms: A randomized clinical study. Medical Science Monitor 2014;20:2183-8. Verissimo M et al. Effect of physical exercise on lipid metabolism in the elderly. Revew of Portuguese Cardiology 2002;21:1099-112.